After testing for a number of months, Google has finally officially launched the mobile-friendly label in mobile search results. Gone are those good old days when people used to use laptops and other mobile devices. Now is the time when everyone owns a smart phone and they use it full-fledgedly to access the internet and search anything under the sun. The shift of trend among the internet users has also forced the SEOs to change the way they formulate their strategy. Instead of only concentrating on search results on computer and desktops, now they also have to make sure that everything is perfect with the mobile users. In an effort to assist the mobile searchers in knowing which sites they might click on are mobile-friendly versus which ones are not, Google has added a text label under each URL in the snippet that reads “Mobile-friendly” as the initial part of the search result’s snippet. According to Google, it can be indeed frustrating for a mobile searcher to land up on a web page that is not at all mobile-friendly and this is why they’re adding the label to their mobile search results to communicate this to the searcher. How does Google know how a user can experience your mobile website? Well, this is yet another viable question that is being raised in the minds of the SEO analysts and the practitioners. Google has always been dropping various kinds of hints that say that they understand mobile experience better for some time now. They even recently launched mobile usability reports in order to help the webmasters find issues with their mobile sites. 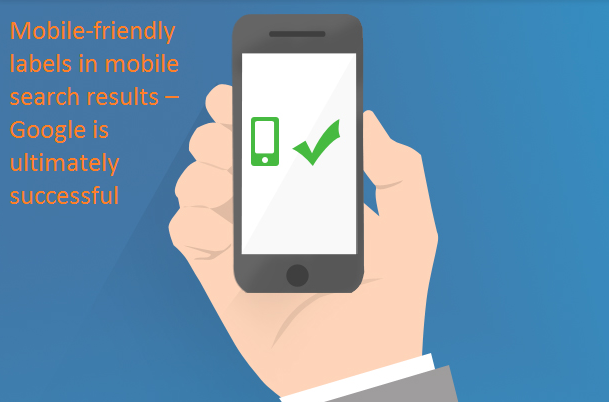 Google also recommends all its users to test their site in the new Mobile-Friendly test tool, review each and every mobile-friendly guidelines and use different third-party tools to go mobile-friendly with their websites. This new mobile-friendly label in mobile search results will soon roll out into the market within the next few weeks in the month of November, 2014.